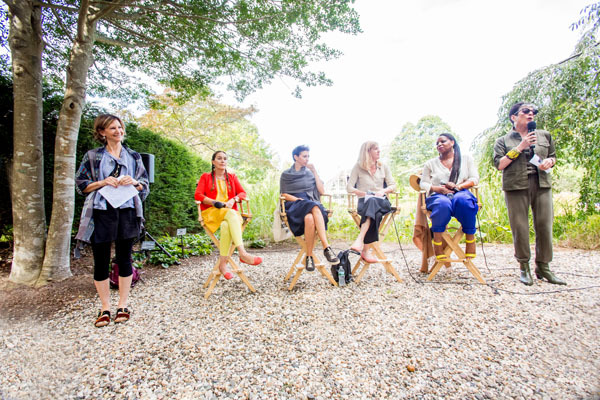 Toni Ross hosted her third panel discussion, entitled Women Artists: Reshaping the Conversation at LongHouse Reserve in East Hampton on September 23, 2017. 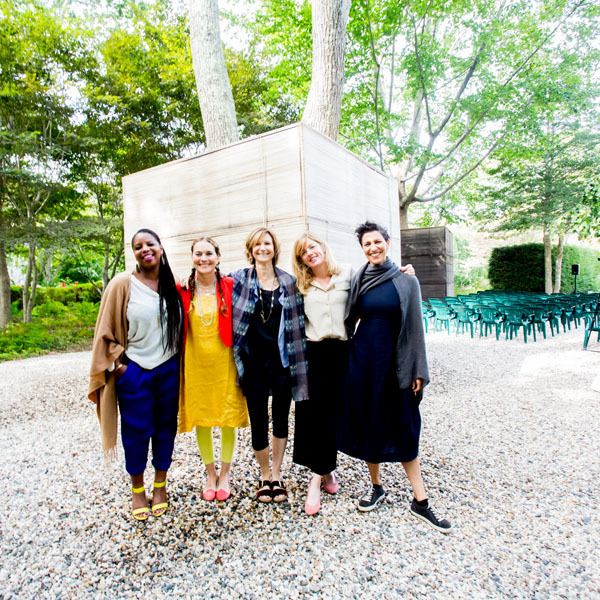 Pernilla Holmes, Zina Saro-Wiwa, Bastienne Schmidt, and Almond Zigmund participated in the discussion. This was the third of a three-part panel discussion series dedicated to Elaine de Kooning. Dianne Benson, the president of LongHouse, also spoke to the audience. This series is underwritten by a contribution from the Alpine Capital Bank, the Aboodi and Hoffman families. Additional generous donations from Integrated Exercise Therapy (IET) of Bridgehampton and Dorothy Lichtenstein. The August 12 event was also made possible by a gift from Tag Associates LLC. The August 26 event was also made possible by a gift from Sheri Sandler. The September 23 event was also made possible by a gift from Neda Young. Special thanks to Andy and Stephen Perlbinder and Ricco Maresca Gallery whose generosity helped make sanctuary entwined a reality. Pernilla Holmes has an MA in History of Art from the Courtauld Institute of Art, and has worked with high-profile contemporary galleries, for major private collections and as an independent curator, advisor and writer. Pernilla has written museum and gallery catalogue texts as well as articles for publications such as the Financial Times, Newsweek, Art Review and ARTnews. She has given talks and panel discussions at such venues as Frieze Art Fair, Frieze Academy, The Arts Club, the Royal Academy and the Royal College of Art. Pernilla has been the director of Wedel Art, and art advisory firm, since 2010 where she works both on building collections and new approaches to art philanthropy. As a curator, Pernilla has worked closely with important artists both established and emerging, including Richard Long, N Dash, Nastio Mosquito, Ryan McNamara, Diana Thater and Theaster Gates on both projects and exhibitions and often at key points in their careers. She is currently co-curator of the Arts Club London’s exhibition program, works with the Emdash Foundation on realizing artist projects and is co-curating a show of 60s and 70s abstract painting this November at Pace Gallery, London. Zina Saro-Wiwa is a video artist. She lives in Brooklyn, New York but also works in the Niger Delta in Nigeria where she founded a contemporary art gallery, Boys’ Quarters Project Space. Alongside her multi-channel videos, Saro-Wiwa makes photographs, documentaries and films. She also creates food-related projects and curates exhibitions regularly. Saro-Wiwa’s interest lies in mapping emotional landscapes and interrogating the relationship between self and environment. She often explores highly personal experiences, carefully recording their choreography, making tangible the space between internal experience and outward performance as well as bringing cross-cultural and environmental/geographic considerations to bear on these articulations. The slippery dynamics between “truth”, “reality” and “performance” lie at the heart of her video work. In her career she has been commissioned by the Menil Collection, Seattle Art Museum and has had work shown at Brooklyn Museum, Tate Britain and the Walther Collection amongst other institutions. Saro-Wiwa is a Guggenheim Fellow, was artist-in-residence at Pratt Institute and was named one of Foreign Policy Magazine’s Global Thinkers of 2016-17. Bastienne Schmidt is a multi-media artist working with photography, painting, and large-scale drawings. She was born in Germany, raised in Greece and Italy, and has lived in New York for the past 20 years. Schmidt grew up in Greece as the daughter of an archaeologist, which influenced her creative process in many ways and instilled in her a desire to organize, map, and attempt to understand systems through her artwork. Inspired by Greek ancient ceramics and their thin lined figure drawings, as well as Japanese woodcuts, fairytales, and American pop culture, her work often incorporates and transforms archetypal shapes. Schmidt’s diverse oeuvre is included in the collection of the Museum of Modern Art in New York, the International Center of Photography, the Brooklyn Museum, the Corcoran Gallery of Art in Washington D.C., the Victoria and Albert Museum in London, and the Bibliothèque nationale in Paris, among others. She has been shown nationally and internationally in over 100 exhibitions, among them: The International Center of Photography in New York, the Brooklyn Museum, the New Museum, Museum fuer Kunst und Gewerbe in Hamburg, and the Southeast Museum of Photography in Daytona Beach, Florida. She has published six monographs, including “Vivir la Muerte,” (1996) “American Dreams,” (1997) “Shadowhome,” (2004) “Home Stills,” (2010) “Topography of Quiet,” (2014) and “Typology of Women,” (2016). Almond Zigmund was raised in Brooklyn and received a BFA from Parsons School of Design, in both New York and Paris. She earned an MFA from the University of Nevada, Las Vegas, where she studied art theory and criticism. Solo exhibitions and installations include: BIG Art, Navy Pier; Childrens Museum of the Arts, Salomon Contemporary Collective Design Fair, New York, NY; Parrish Art Museum, Southampton, NY; Glenn Horowitz and The Drawing Room, East Hampton, NY; Tall Wall Gallery, Los Angeles, CA; Rebecca Ibel Gallery, Columbus, OH; Dust Gallery, Las Vegas, NV; among others. 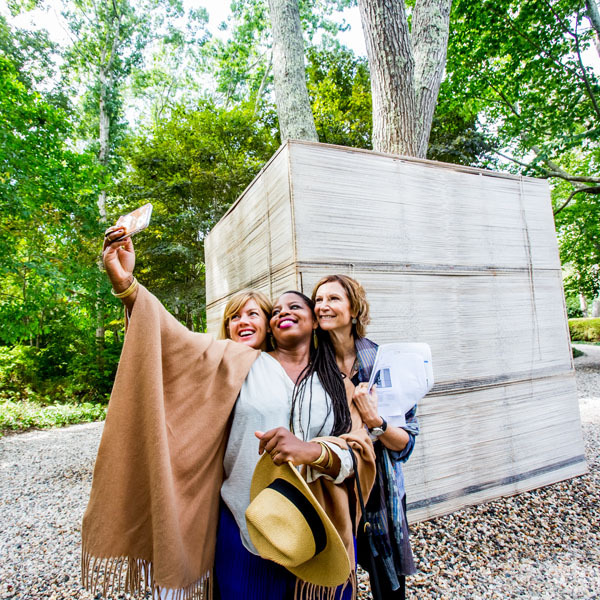 She currently divides her time between Brooklyn and East Hampton, NY. About Toni Ross: Artist Toni Ross has developed a sculptural language focused on the architectural and cubic aspects of mass, volume and interior space. In her oeuvre, she has examined form through an evolving lexicon that addresses visual relationships in shape and surface, balance and instability and elements of constraint, expressionism and transience. In new works, Ross explores structure in large-scale, site-specific installations that engage and transform the environment. Born and raised in New York City, Toni Ross attended Wesleyan University where she studied ceramics and the arts, graduating with a BA in Film Studies. Her education continued in Italy, where she immersed herself in the great traditions of the Renaissance and the Middle Ages. Since then, Ross’s practice has expanded to include non-traditional works in stoneware, site-responsive installation, drawing and painting.